Silk is the most luxurious & comfortable fabric which can give you a classy & elegant look. Today’s fashionistas literally die for the designer attire made by silk. Starting from designer sarees to indo-western attire, silk is always the best pick for the designers. Bollywood has a constant love for silk and we have spotted celebrities many times wearing silk fabric. Why is Silk fabric good for daily wear? Strength: It has a good tensile strength which allows withstanding the great pulling pressure. Resilience: It maintains the shape and almost wrinkling free. Drapability: Silk is very easy to drape. Cleanliness and Washability: It has a smooth surface, so doesn’t attract dirt and easy to clean also. Sonam Kapoor wearing designer Lehenga: When we are talking about Bollywood fashion, the first name that comes to our mind is Sonam Kapoor. The Neerja actress spotted wearing a gorgeous blue and golden lehenga designed by Gaurang Shah. It was a cream color silk lehenga with knee length full sleeve blouse. The dupatta had heavy golden benarasi work. Sonam was looking elegant & graceful. 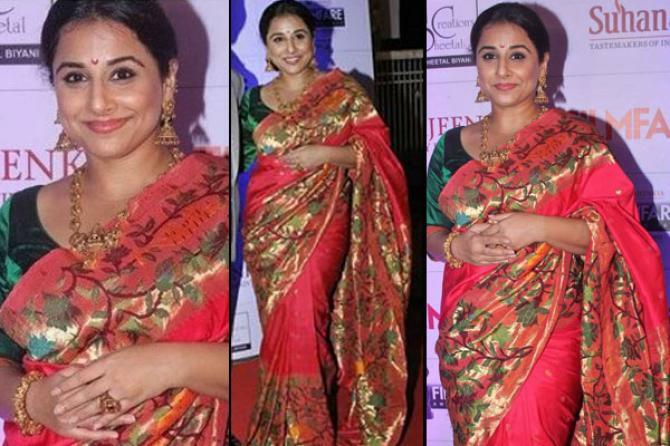 Vidya Balan in Kanjeevaram Saree: We all know about the saree love of Vidya Balan. The Kahaani actress spotted many times wearing saree. She draped in an orange and green kanjivaram silk saree at 17th Mumbai Film Festival. The gold temple jewelry adds oomph to her look. Kareena Kapoor wearing designer Gown: Kareena, the queen of oomph & elegance in Bollywood. She has made us bowled many times with her mesmerizing style statement. She spotted wearing a rose print silk gown in a photo shoot designed by Naeem Khan. The black and white combination has added a touch of elegance to her look. Deepika Padukone in Silk Salwar: How could we forget her name when we are talking about Bollywood fashion? The gorgeous Deepika spotted wearing a yellow color silk salwar kameez with high collar neck & wide golden zari border. The gold glittering high-heel and clutch complement her look. Shraddha Kapoor in designer Lehenga: Shraddha was the show stopper for Manish Malhotra at Lakme Fashion Week last year. She walked on ramp wearing a dark green silk lehenga with golden embroidery work. The 29-year-old “Baaghi” actress was looking like a Goddess. She admitted it was like a “dream comes true” experience for her. Shraddha was looking gorgeous while posing for shutterbugs. Aditi Rao Hydari in IIFA 2016: Aditi looked absolutely stunning in the dark green off-shoulder Shantanu and Nikhil dress. The golden hairband and earring added a fanciful touch to the ensemble. Silk fabric comes in ravishing colors and shades. The splendid texture makes it the first choice of Bollywood Divas. Fashion designers love to use silk in their creations. Starting from silk saree to designer silk lehenga, this fabric is ideal for an exclusive ethnic closet. If you are planning to buy ethnic attires made by silk, then Sareez.com is the one stop shop for Indian ethnic fashion. Here you can get latest silk saree designs at an inexpensive price. Shop with Sareez.com to relish hassle free shopping experience.